If you are new to soap making, you can learn how to make soap in this 7 Easy Steps to Homemade Lye Soap fro Beginners tutorial. It will walk you through the ingredients and tools needed and help you learn more about the safety of handling lye and essential oils. Making salt soap is slightly different, so I will walk you through the ins and outs of it below, but already having a general understanding of soap making is helpful. BEFORE you try these recipe you must learn about How to make them. You can change the amount of salt. For a more typical body bar with a highly lather and less exfoliating, try 50% of salt compared to the amount of oils. Want a true salt bar, increase the salt to 100% of the amount of oils (32oz oils in the recipe, use 32oz salt). These set up fast. Add any coloring and fragrance to your batch at trace before adding the salt. It’s best to use a segmented mold, but if you only have a slab mold, then remove it from the mold after 3-4 hours or it will be too hard to cut and may crumble. You can use the oven method by heating the oven to its lowest temperature and turning it off when you place the soap in it. Check after 3-4 hours. 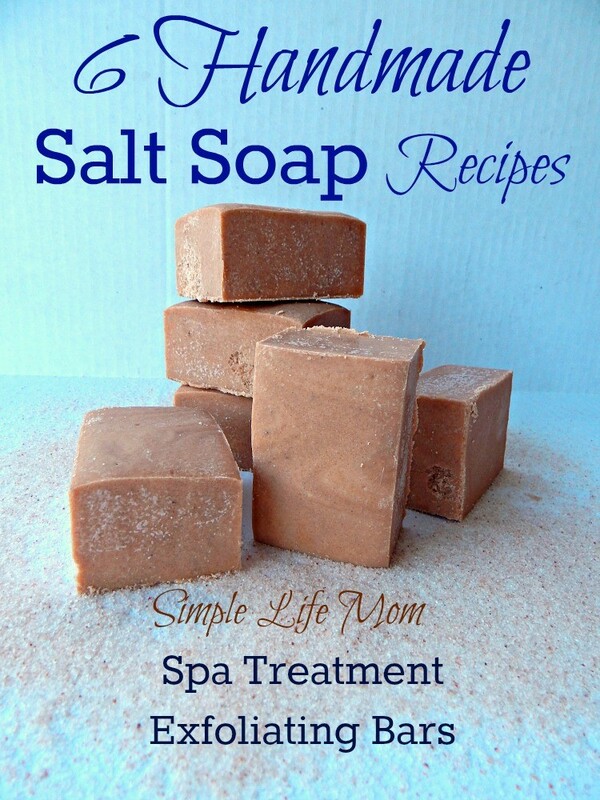 This is not necessary if your salt content is very low or you have a divided soap mold. BUY THESE IN MY STORE! Combine oils, melt, and then cool to 90-100 degrees F.
Add lye to water out in an open aired location and cool to 90-100 degrees F.
Add lye water to oils and mix with hand mixer on and off until it comes to light trace. Add essential oils and salt and combine. Pour into mold and let set for 3-4 hours before cutting. If you don’t have a source for good tallow you can try Here. Etsy actually has a lot at good prices. So check it out too. How amazing, Kelly! I thought the process of making soaps is far more difficult than that! It looks like so muh fun! I can’t wait to try them out myself! Spa-like soup in your own bathroom! Sure like the sound of that and the savings when you make your own products! Very true. And you can’t beat the ingredients. I’ve never made homemade soaps before, but with your recipes I bet I could!! So many wonderful options too!! Thanks for sharing!! You’re welcome Elaine. Thanks for stopping by. Does this have to cure for the 4-6 weeks as well or can it be used immediately? Traditionally, soaps cures for that amount of time for hardness. It’s also come to mean, traditionally, that the lye is still processing during this time. That’s not true. Scientifically speaking, the saponification of any soap processing is finished after about 48 hours. These bars get hard before you can even pull them out so yes, even though someone will yell at me, ill say you can use them after a few days. Give them a week to be safe. It’s impossible to make soap without lye. Even the melt and pour bases have lye, they’ve just already done that part for you. Sorry. I love the salt soaps. When I was little, yea I know me and rocks, I use to help my Grandmother melt the left over soap bars to make one bar and not waste any. How can I do this with the salt soaps? 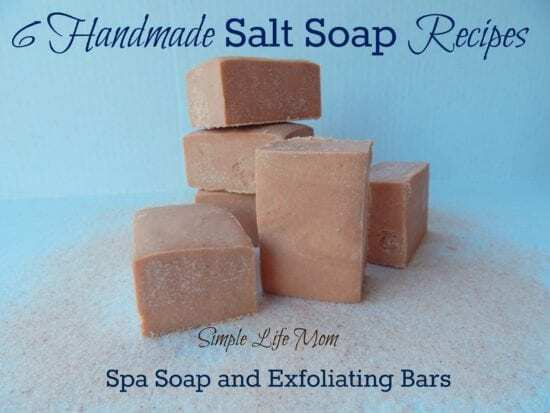 You want to hot process soap pieces or shavings and make them into a salt soap bar? These soaps are made with more coconut oil and higher superfatting (leftover oils). These two items make it non drying and still bubbly,etc. You’re not necessarily going to have that if you just take scrap soap. As you’re melting very slowly in a saucepan or slowcooker it will become bubbly and change, looking mire like mashed potatoes. At this point add enough salt to create the desired consistency. The exact amount will vary based on the amount of scrap soap you have and the percentage of salt you want. It will be thick. Scoop into a mold amd let cool before use. Can you use coconut milk in place of the goat milk? And what should the ratio of water to milk be? Yes you can. I don’t like to sub more than 50% of the water with milk, because you’re more likely to run into problems like your soap over heating, etc. But you can if you want to. Just go slow when adding lye and don’t incubate with towels later, just cover with a lid and let cure for the 24 hours. I’ve never tried, but I don’t see why not. Hi Kelly. Nice work! I haven’t attempted making soap yet, guess am having cold feet, but would like to attempt the coconut oil soap. I would like a recipe to make 1 Ib of 100% coconut oil soap with 20-30% super fat. Thanks in advance. Hi Stephany. Go to soapcalc.net, lye calculator, then change to ounces and change the superfat amount. Add coconut oil and calculate and it will tell you how much water and lye to use. It’ll make a very hard bar that oddly dissappears quickly as you use it. I am so happy for your article, I made my first soap last night coffee & milk, it came out nice but I don’t have all the nice techniques that are out there yet. I will try to make carrots and cucumbers tonight and I might just make yogurt and raspberry too. there will be for Christmas present for friends and family. thanks please keep the articles coming. Hi there, what type of salt do you recommend and where do you buy from? I think I had read once not to use dead salt because it would be mushy, but I have no idea what is dead salt and what kinds of salt I should use instead. Thank you for your help! I’m so excited to find your website! I’ve been wanting to specifically learn about shampoo bars and salt bars and have found so much wonderful info from your site. I also just bought your PDF on soap making. Hi Debra. You can use any Himalayan rock salt, or even table salt if that’s what you have on hand. Dead sea salt has a lot of minerals and more than anything It will make the soap “weep” because of the moisture draw from it. Hi, I love your recipes. However, am only familiar with SI units. Is the oz of oil, Fluid ounce, equivalent to 29.5735ml? (as per google). Are you using fluid ounce in your recipes above? And for the salt? Is it 1 ounce to 28.3495 grammes (as per google)? They are dry ounces, not fluid ounces. Yes, 1 ounce is about 28 grams. I made a badge last night of your Recipe #4 – 3 lb and I have a few questions. Your recipe reads 50% Coconut oil, 50% Salt, 15% Superfat and I followed the recipe. I am a little bit concern about the 30 – oz of salt (sea salt) that you list on your recipe and that I used. Is it suppose to look salty? I did the CPOP method (170 degrees for 30 minutes) with your recipe. Will that hurt my batch? I am a little anxious about the look. It had a little bit of sweat even though it is now gone and a could literally see the salt. Made by the normal cp method it should have a smooth texture, but not be as creamy looking as a non-salt soap. By heating for thirty minutes and stirring you moved it along the process and changed the texture of the outside. It should be totally fine though. Just remember to remove it from the mold after a few hours instead of the usual 24, or they may crumble when cut or removed. Thank you for your speedy reply. I would have hated to trash the batch. I would like to try one of your salt soaps but I don’t have any castor oil on hand, is there another oil that I can substitute for it? There really isn’t a good substitute for castor oil. You can use more of another oil to make up for the loss in volume and run it through a lye calculator to make sure your numbers are still all right. I made one of the salt soap recipes yesterday and after cutting it I realized that I didn’t get the salt completely mixed in! Do I need to redo the batch? will the salty parts crumble? They seem like they would now but what about when they are cured? Thanks! I hate to waste this batch! The salt parts that aren’t mixed in as well will crumble. If they are only small bits it should be fine. If you have golf ball sized chunks then you can either discard that bar or hot process.